Round ups might become an every-other week event if my schedule doesn’t let up soon. I still feel a little behind on the preservation goings on in Mississippi but let’s jump right on in to this week’s roundup. The Architecture History Section is hitting the road in March for our regional training sessions in Biloxi, Starkville, Hattiesburg, and Greenville. All sessions are free and open to the public. For more information and to sign up, follow the links! Thanks so much to our local Historic Preservation Commission/Certified Local Government and Main Street partners for helping us come to your communities. If this sounds of interest to you be sure to sign up! Kuhn Hospital, one of the popular Abandoned Mississippi series. The city of Vicksburg has applied for two EPA Brownfields cleanup grants totaling $400,000 to cover part of the $850,000 expense to demolish all the buildings on the Kuhn Memorial Hospital campus. Both the 1959 and the 1962 buildings were likely designed by Vicksburg architect Raymond Birchett. The site has to be abated before it can be demolished, so it seems ridiculous that once the structures are abated of hazardous elements the building cannot be mothballed, and a better reuse than being dumped in a landfill can found for the structures. I don’t know about you but as a taxpayer I grow weary of funding destruction projects when options for restoration are available. B’nai B’rith (B.B.) Literary Club. Vicksburg, Warren County. 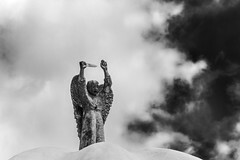 Photo by J. Baughn, MDAH. Retrieved 12/07/12 from Mississippi Historic Resources Inventory (HRI) Database. The Vicksburg Post ran a history of the B’nai B’rith Literary Club in celebration of the one hundredth anniversary of the construction of their clubhouse on the corner of Clay and Walnut Streets. The elaborate clubhouse was one of the first projects of architect Leon C. Weiss. Two articles about museums of interest appeared recently. 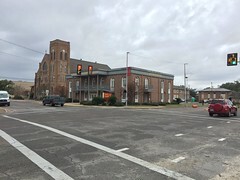 One concerning the Mississippi Native American Museum in Kosciusko, which is proposed to be housed in the former Leonard’s Department store located at the intersection of S. Madison Street and W. Jefferson Street. While the article states that an architecture firm has been hired for the museum work, it did not state if the building will be restored to its original c.1895 appearance, or if the current mid-century appearance will be restored. The other is about the Ida B. Wells-Barnett Museum in Holly Springs, which is housed in the Spires Bolling House. Wells was born on the Spires Bolling property and while enslaved her father served as an apprentice carpenter during the construction of the Spires Bolling House. Staying in Holly Springs, University of Mississippi professor Jodi Skipper has received a national honor in the form of a Whiting Public Engagement Fellowship from the Whiting Foundation, “in recognition of her involvement with the Behind the Big House program, a slave dwelling interpretation program started by Jenifer Eggleston and Chelius Carter in Holly Springs.” The Whiting Public Engagement Fellowship, in its second year, is designed to support faculty who embrace public engagement as part of their scholarly vocation. Up in Hernando, the DeSoto Arts Council is working to rehabilitate the old Hernando City Hall. While they have received a $10,000 gift, they have four months to raise a $10,000 match from the community. 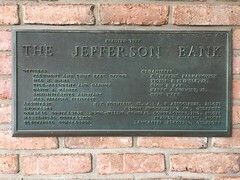 These funds will be used to “upgrade and preserve” the building. It looks like the city hall also once served as a fire station, with a large vehicular door on the front facade. Often city halls in small towns served dual purposes such as a fire station/city hall. If this is the case it will be neat to see the engine bay door restored. MERIDIAN, MISSISSIPPI . . . 21st Avenue, showing the Three Foot Building in the background and world-famous Weidmann’s Restaurant in right foreground. An article in the Meridian Star had the headline “Downtown Meridian shows signs of rebirth” and has a line worth quoting. One thing (Kenny) Watts likes about downtown Meridian – many of its historic buildings still stand, maintaining the area’s cultural and aesthetic value. These signs of rebirth in downtown Meridian may come too late for the rising number of lost historic places, but not for the remaining cool old places in Meridian’s Downtown. Meridian, there is still time to repent your demolition ways and be saved! Some news now from McComb. The city board there has applied for some for grant funding to save a sand tower that is currently owned by Canadian National Railway (CN). Currently in the middle of the rail yard, CN had planned to demolish the tower, when the city expressed interest in saving the tower. I don’t have access to the complete article, so I’m not sure how old the tower might be. The rail yard that is otherwise well documented by MDAH in the Historic Resource Database as part of the Kramertown Historic District, does not have an entry for the sanding tower. Hopefully its new location at the foot of Main Street will not be too far from a rail line. Taken out of context the structure could be difficult to interpret as to what its former function was. I’m not sure what grant the city is applying for but I’m glad to see that the city is working to preserve their heritage and this piece of rail history. The Hattiesburg American reported that the Historic Hattiesburg Downtown Association is partnering with Mississippi Power Co. to award grants of up to $1,500 to downtown merchants to use for enhancing their buildings’ exteriors. We hope these facade grants from will consider historic preservation while sprucing up facades. Tatum Court Administration Building (1912), William Carey College, Hattiesburg. Photo June 2013. 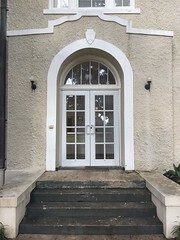 The Mississippi Business Journal reported that William Carey University was planning to destroy Tatum Hall during the University’s spring break which took place March 14-18. This is the latest of several historic buildings demolished after the recent tornado. In Purvis, Lamar County School Board officials considered a historic marker for African-American John Jefferson High School. The board seemed to confuse the placement of a historic marker with the act of designating a building a Mississippi Landmark, because they expressed some concern that the placement of a marker would dictate what could be done to the building in the future. I was unfamiliar with John Jefferson High and was curious if it was an Equalization school, but I was surprised to find that it doesn’t have an entry in the MDAH Historic Resource Inventory. Down in Gulfport several news outlets covered the demolition of multiple historic buildings to make way for a proposed aquarium. With a whopping $56 million estimate cost budgeted for construction (how long before that amount goes up? ), you would think that incorporating some historic buildings into the aquarium campus that would be eligible for preservation tax credits would be a win-win situation; historic places saved and costs for construction comes down. This is truly sad and a lost opportunity for the people of Gulfport. 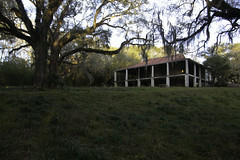 Moving over to Pascagoula, the Sun Herald reported on an update of the work underway to the de la Pointe Krebs House. In a report to the Jackson County Board of Supervisors (Jackson County owns the structure), Deputy State Historic Preservation Officer Ken P’Pool and Architect Larry Albert let county leaders know that the first phase of renovation left the structure more level and structurally sound. The next step is a proper roof. 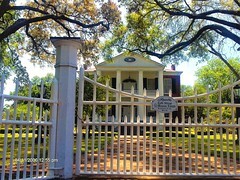 March 14-16 was National Historic Preservation Advocacy “Week”. Amber Lombardo, Mississippi Heritage Trust’s Director of Programs was in Washington D.C. meeting with policy makers to promote and advocate including historic preservation in their decision making for the upcoming year. Preservation Maryland has provided a breakdown of how President Trump’s budget will affect historic preservation efforts across the country. Regardless of your politics, I don’t think you’ll find this budget is one that is friendly to preservation & historic places. If you’re curious as to where federal funding for historic preservation comes from, it’s likely income from offshore oil and gas leases in the Gulf of Mexico. In Federal Fiscal Year 2015, these leases generated $5.1 billion in total revenue that was distributed to the Federal Treasury, state governments, Land and Water Conservation Fund, and the Historic Preservation Fund. Pilgrimages are starting to get underway and several other preservation themed events are coming up. Follow the links below to see what’s going on in your neck of the woods. Attending events like these is a great way to support local grassroots preservation efforts. Like always, I probably missed quite a few stories, so if you know of any preservation-related news items not mentioned, or if you have more information about a story above please let us know in the comments below.